Option 2 has a development happening on that corner sometime in the near future doesn't it? Also you'd be putting sick children amongst the drunken rabble of Hindley St. I'd be more for Option 1 or Option 4 out of harms way. That end of Hindley Street is pretty quiet nowadays, UniSA has taken over a big chunk of it and both HQ and Empire are gone. 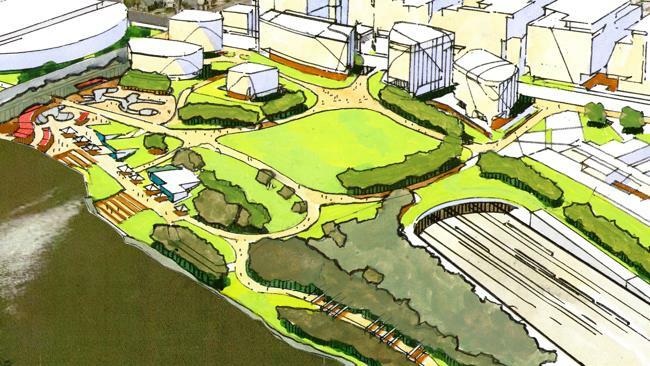 I'd prefer option 4, if it was part of a strategy for enhancing that riverbank area by building over the tracks and better connecting North Terrace to the Torrens. For some reference, the ACC concept from 2013. Something like this should be a long term goal and I would love to see developments like the Womens and Childrens built working towards that goal. This area could really become a space like Brisbanes South Bank, something Adelaide doesn't have an equivalent to right now. Maybe sink the train line underground [tunnel] so option 1 can extend into the option 3 area...to give them the extra space needed while having the air bridge/link to the existing RAH - which is the key purpose they are looking for. Option 1 and get 'the flightpath' lifted. We need to stop treating the airspace surfaces over our city as sacred unchangeable laws written in stone - they aren't. Government has the power to change them. CASA/Air Services change them all the time to suit themselves and the airlines. It's time that government and planning authorities started to push back on these unreasonable limits on development, for the benefit of the people of Adelaide and taxpayers. Approach angles could be easily increased and this would also provide a benefit to the people of North Adelaide in terms of noise. Approach angles could be easily increased. What do you think an acceptable approach angle would be, keeping in mind the need to accommodate situations such as an aircraft suffering engine failure doing a glide approach? edit: Looking into it, it seems like there was a proposal a couple of years ago based on the trial Heathrow is currently conducting where they have aircraft on a 3.2 degrees approach angle rather than the standard 3. Even if that was adopted however you come into the issue that the side west of the RAH is pretty much directly under the approach path for aircraft landing on 23 at YPAD. An increase in approach angle to 3.2 degrees would net a whole 35 feet of extra altitude for aircraft passing over that site. Last edited by Nort on Thu Aug 02, 2018 11:48 am, edited 1 time in total. Why are the zones so determined by the train tracks? Surely it is possible to build adjacent to the existing hospital, over the tracks toward the river, or over the tracks between the existing hospital and the police barracks still leaving the small activation area along the torrens suggested by the ACC. I see a lot of angst about vibration from trains, but surely there is relatively simple building technology available to mitigate this even without the need for tunnelling. There is something wrong with the flight path logic. Option 1 right next to the existing hospital is "In the critical flight path" but Option 3 is "Allow for larger heights than RAH expansion zone, but still flight path-affected". 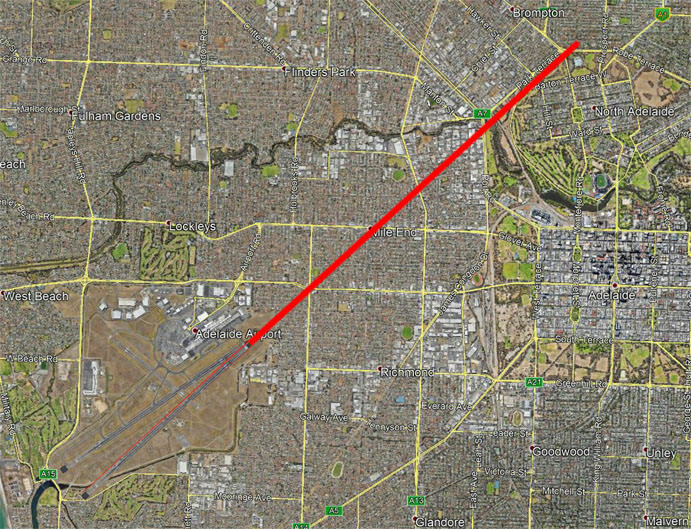 The straight-line extension of the runway passes over the Bonython Park carpark, closer to Option 3 (especially a and b) than Option 1. Option 4 would need to be a pretty special building - it blocks the views both of and from the hospital. I'd like to leave Option 1 as space for expanding the RAH in future if required (and affordable). In time, the railway constraints could change, too. Option 2 looks ideal at the moment. I'm not sure exactly what the Adelaide Day Hospital is, but it could likely be included or subsumed. Fairmont Homes looks like an office building that might not need to be redone, but just rent floors in it as they become available. The heritage hotel on the corner is an appropriate place for food for visitors and patients getting out of the hosspital for a few hours. McDonalds is probably popular near a children's hospital. Everything else on that block looks like it is ripe for redevelopment, with the possible exception of the little rows of terrace houses on Gray Street, and maybe keep the carpark. What is built on top of it in the 2015 timeframe (it's not in older streetview or the 3D model)? I think even leaving those elements in place, there is sufficient space to build a reasonable W+C hospital, especially with "no height restrictions" (I bet there would be unwritten ones, right on the edge of the square mile). Why can't there be an option 5 on the oval on the corner of West Tce and Port Rd. Because they've spent millions redeveloping it and it will be used by SACA. Option 1 + Plot C from Option 3 is the best option. Two main buildings on either side of the rail line, linked together and with the RAH by a walkway bridge. There's already a road or 'loop' that turns left once you come in off Port Road and heads underneath eastward to the underground car parking for staff. So re-configuring that for an underground car park on Option 1 wouldn't be difficult. Plot A on Option 3 and Option 2 are unlikely to happen because of the heritage buildings, and the Plot A(Option 2) is used by SAPOL for training, it's also the base for the SAPOL K9 units, as well as the SAPOL horses. Plot B is a chunk of Bonython Park..so yeh nah wont happen. Option 4 isn't kind of tucked away. Close to the train station so public transport isn't an issue. A road link to the Morphett st bridge. Perhaps they could figure out an option to add a road link to the road on the northern side of the RAH or the road between SAHMRI and the Uni buildings. I mean, we've lost the chance to turn the riverbank into a major entertainment destination that would have drawn in visitors like Adelaide has never seen before and changed the face of Adelaide, so may a well drop another hospital on the riverbank at this stage. I agree mostly with this, however something I never considered until reading the recent article is space required for any further RAH expansion, going up would be an issue considering the flight path so perhaps Option 1 does need to be left to allow for such an expansion in the future. They could expand over the car park on the western side and southern side. Could add another 3-4 levels over the car parks. The southern car park directly in front of the Emergency Department entrance, those levels directly above are the operating theaters, ICU and recovery unit. So if the need to add more capacity in that regard ever arose that would imo be the logical place to expand. If they needed more over night beds, the 'controversially' painted northern side could be expanded..plenty of room to add hundreds of new rooms from I believe level 3 or 4 up to level 9 across the length of the building on that side. Could also expand northward over the train lines. Agree with all of this Rev. The oval on the other side of the road would never be considered as it is in the "parklands proper" and probably a step too far. I also think the SE corner adjacent to the Newmarket hotel is a bit disconnected from the main hospital site, even though it is just over the road, it cannot realistically have connecting walkways or corridors with the main hospital. There appears to be plenty of room for hospital expansion on the Northern side, so as you say, option 1 and plot C are probably logistically the best. THE site of the historic Newmarket Hotel is now the preferred option for the building of the new $1.8 billion Women’s and Children’s Hospital, it can be revealed. The Advertiser has been told senior WCH staff were briefed this week that the site, over two city blocks at the corner of West and North terraces, has jumped to the top of the queue of four options because of major issues with other proposed locations. The current proposal is for the WCH build to begin in 2022 and to be completed within three years. The imperative to build the hospital as close as possible to the Royal Adelaide Hospital will still be achieved but there remain several issues to overcome. They include the large amount of compulsory acquisition of properties and issues around several heritage-listed buildings, including the Newmarket. The proposal includes retaining and using the facade of the Newmarket in the hospital build. An air bridge across North Tce would link the two hospitals but would be “costly”, staff were told. The meeting heard the preferred option is a “clean site with no known contamination”. A senior doctor, who wished not to be named, said there would likely be significant objections from the public about the acquisition of property and the large cost of the hospital. “The public will not be happy this hospital will be basically the same price of the RAH but half the size,” they said. Freedom of Information documents secured by The Advertiser and published last month revealed there was a strong view among clinicians that the WCH should be connected to the new RAH, ensuring that women who have high-risk pregnancies get swift access to sophisticated treatment, including an adult intensive care unit. Women and their babies in clinical emergency situations are currently transferred from the WCH to the Flinders Medical Centre because the RAH has no facility to care for the child. Other locations under consideration for a new WCH included a site directly adjacent to the RAH, on the nearby railyards, a site by the Thebarton Police Barracks and one on the Parklands between the train line and River Torrens, near the South Australian Health and Medical Research Institute’s “cheese grater” building. The site on the railyards was the initial preferred option but the WCH meeting was told it had been found to be too small. It sits within the critical flight path that allows only for buildings of seven storeys, but a 12-storey build would have been required on that particular footprint. Building on the Parklands was thought to prove too controversial and would likely be opposed by the influential Save The Parklands Group. The future of the Newmarket, once one of Adelaide’s most popular nightclubs, has been in doubt for several years. In 2015 it was announced that the building would be partly demolished and a $200 million, 24-storey residential and retail tower built in its place. In April, newly elected Premier Steven Marshall announced an expert taskforce, led by former WCH chief Jim Birch, would be formed to plan construction of the new women’s and children’s hospital alongside the Royal Adelaide, in a move to “future proof” SA’s health system. Mr Marshall set a target date for completion of 2024. WCH staff were told this week a final report of the taskforce was being prepared for the end of the year and a feasibility study of the chosen option would be completed by March 2019. An SA Health spokeswomen confirmed that the taskforce was “working through the process” and will report at end of year.